What is this? 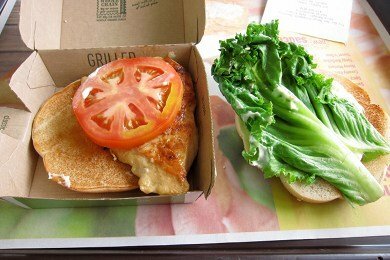 A new addition to the McDonald's menu called the "Premium Grilled Chicken Classic Sandwich" has arrived. The photo above is one that I purchased for $4.70 at my local McDonald's. Look at that lettuce and tomato! And, the chicken is not a McNugget or other concocted form - it is an actually a piece of chicken breast. The ingredients are listed below and the list is rather, well, lengthy. What I find so interesting is that this is an attempt at a pretty healthy sandwich. When you compare it to the 800 calorie (21 Points+) Angus Chipotle BBQ Bacon burger - the chicken sandwich looks virtuous. Did it taste good? Yes, it did. I was forced at gun point back to McDonald's this week and I had this sandwich with mustard (zero calories) instead of the mayo. It is a bit salty, but I liked it. You see, my kids love the big plastic play thingy that graces the front of our McDonald's and they beg me to take them there. Given my job and all that I know about fast food, I should just tell them to forget it - but they are so persistent! When you order make sure you order the CLASSIC chicken sandwich. The other versions contain things like bacon and cheese and before you know it - 350 calories is just a distant memory. Have you tried this new sandwich? New Grilled Chicken Fillet: Boneless skinless chicken breast fillets with rib meat, water, seasoning (rice starch, salt, sugar, yeast extract, canola oil, onion powder, maltodextrin, chicken skin, paprika, flavor, sunflower oil, chicken, garlic powder, chicken fat, spices), sodium phosphates. Prepared with Liquid Margarine: Liquid soybean oil and hydrogenated cottonseed and soybean oils, water, partially hydrogenated soybean oil, salt, soy lecithin, mono-and diglycerides, sodium benzoate and potassium sorbate (preservatives), artificial flavor, citric acid, vitamin A palmitate, beta carotene (color). CONTAINS: SOY LECITHIN. Bakery Style Bun: Enriched flour (bleached wheat flour, malted barley flour, niacin, reduced iron, thiamin mononitrate, riboflavin, folic acid), water, whole wheat flour, high fructose corn syrup, honey, wheat gluten, contains 2% or less of the following: yeast, soybean oil, maltodextrin (dietary fiber), salt, calcium sulfate, dough conditioners (wheat flour, datem, ascorbic acid, azodicarbonamide, sodium stearoyl lactylate, mono and diglycerides, enzymes, calcium peroxide), ammonium sulfate, natural flavor (botanical source), calcium propionate (preservative), vitamin D3, rolled wheat (topping). CONTAINS: WHEAT. Mayonnaise Dressing: Water, soybean oil, distilled vinegar, maltodextrin, food starch-modified, enzyme modified egg yolk, salt, sugar, xanthan gum, mustard flour, potassium sorbate (preservative), lemon juice concentrate, polysorbate 80, natural flavor (animal source), calcium disodium EDTA to protect flavor, beta carotene (color). I've had it and I think it tasted like they injected the chicken with a chicken bullion cube. I was rather disgusted by it and won't be getting it again. I just don't get why something as simple as a chicken filet has to have all of those ingredients!? This is a bit better than most other selections at McD's for its proximity to real food.. It's nice of them to try. I'd still rather have the locally grown chickens raised in pasture that I get from a nearby farm, with tomatoes and peppers from my back yard. I must admit I don't make my bread or my mayo, but I try to get the best wheat buns I can get..
Great article. Any idea how many points the sandwich has without the mayo? Sometimes McDonald's is the only option. In those cases, I'd go for this (and toss the bun) or one of their salads w/grilled chicken. The food quality is poor, especially for someone used to fresh local/organic produce and higher-quality meat, but at least you can control the calories and nutrient content (in my case, carbs.) I think the chicken breast itself is pretty bad, though. It's way too salty, and no one needs all those chemicals and preservatives in the "seasoning." But, as I said, sometimes it's the best you can do. Who knew that chicken breast could be so complicated? I'll admit, though, that it does look good. The problem is usually that when you actually get there, you get lifeless lettuce and tasteless tomatoes. This is silly, but I'm pretty sure that the forty pounds I lost after I went vegetarian all came from not eating the McDonalds dollar double cheeseburger. That thing is the bane of college students! This is nicer, though I never did care much for grilled chicken. It tastes funny. Sure looks dry! love their murderous fries!! lol!! That's about it though. Seriously, artifical color in grilled chicken??? Tht chicken is also probably the cheap hormone injected kind. I'd never step foot in a Mcdonalds. Oops, I meant artificial flavor not color. I can go for Micky D's whenever I'm feeling bad, and "healthy" food just isn't gonna cut it. My thought is once in a great moon isn't going to kill anyone. And their Apple Pie is to DIE FOR!! From an annoucement about a proposed rule by the USDA/FSIS to label raw meat:. A petition submitted by the Truthful Labeling Coalition (TLC) compared the sodium content in 4 ounces of a single ingredient, raw poultry product to 4 ounces of a poultry product with added solution and found a more than eightfold increase in the amount of sodium between the two, 45 mg and 370 mg, respectively. On a recent road trip with my hubby, I was "forced" to eat at McD's. I opted for the chipotle chicken (grilled) wrap, minus the cheese. Although I didn't order the fries (my downfall most of the time), I did manage to steal a few that came with my hubby's big mac. It didn't seem like much to eat at first but afterwards, I was pretty satisfied. I'm not sure how "lite" it was but at least I didn't feel guilty afterwards like I do with most of their menu items. After seeing all those ingredients, I went to the McDonalds web site to check out the stats on the bun and chicken. Apparently 200 of the 350 calories come from the bun alone! Good call on dropping the mayo which is 50 calories. Reason 1,850 NOT to eat at McDonald's, look at the ingredients. Not that I'm judging, I bought my kids McDonald's the other day but, like you suggest I get apple dippers in place of fries. They love apple dippers. We order off the $1.00 to avoid extra food that goes to waste and we do not order sodas or shakes. All that said, I feel very guilty giving into that option for them, when I won't eat there. I ate this a few weeks ago. I had a long night of driving ahead and needed something I could eat while on the highway. It was 'emergency food'. When I looked and realized it was under 400 calories I figured 'why not' and the good news is I had no stomach issues or whatever...so I consider it a win (even though if given the choice I'd choose any other chicken sandwich when NOT in a pinch like that). Even if I were a starving poor person, I'd NEVER eat ANYTHING from Mcdonalds. I'd rather starve to death. I'm not even kidding. I wouldn't even drink their cheap water (unless it's filtered or alkalized, which I higly doubt it is). I am often the "odd man out" in restaurant/food situations. This is often my choice. I get it with only lettuce and tomato. The cashier gives me that *side eye* glance because I don't want it slathered with mayo but...I haven't had one in about 6 months so I'm doing even better staying totally away from McDonald's.